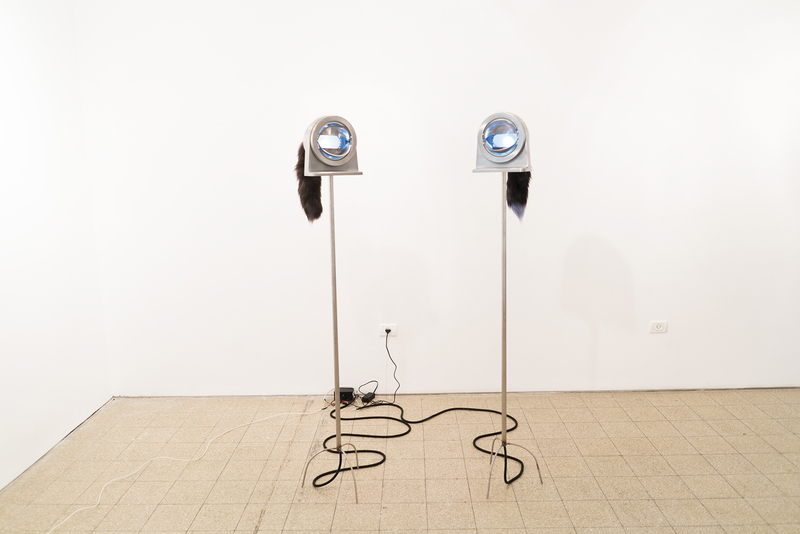 Uriel Ziv is a multidisciplinary artist who lives and works in Israel. He was born in 1981 in Jerusalem and is the eldest son of a very Orthodox family of seven. He studied film at the Sam Spiegel Jerusalem School and graduated from Bezalel Academy of Arts and Design in Jerusalem. In 2013 he participated at the Eco Cinema Film Festival and received the Ralph Inbar Award for Graduation Exhibition. His works were exhibited in several group exhibitions. In 2014 he was given a solo exhibition at the Ramat Gan Museum of Israeli Art. What is your view on modern technology? I think we live in an era of screens, that surround us constantly throughout our days, throughout our lives, a plethora of electronic devices is engulfing us in the public sphere as well as the private one, in the streets, and in our own pockets. Can you tell me why are you attracted by screens? I recollect my youth in an extremely Orthodox Jewish household, a household with no computer, no television, no expression on new technology but rejection and general fear. This blockade enforced on me by the educating figures in my early life has driven me towards total fascination with these forbidden screens. What is your opinion about the bond between humans and smartphones? As an artist I am fascinated by this connection between man and screen, a connection that is both physical and metaphysical. The physical aspects can be demonstrated by bodily engagements – the hand engages with the smartphone; the finger engages with the screen; our facial expression engages with the camera as we take a selfie. What’s the metaphysical connection then? The metaphysical aspects are somewhat more elusive, but just as present – the mirror reflection on a “black” switched off screen; the metamorphosis that the character undergoes between the moment of the photograph snapshot to the moment in which it is exhibited and manifested in social media; the dual identity and presence of a person both in a physical spatiotemporal realm as well as a representational virtual cyber realm. Has the advent of smartphones changed the concept of one’s identity? The personal screens we all own contain within them – in their digital memories, cloud storages, and social network databases – fractures of our multiple identities. Identities that are constantly constructed and reconstructed, copied and pasted, transformed and transfigured in the various online media platforms in which we engage with. What about two of your latest artworks Heaven LC-123BK and Arrow in the Eye? Heaven LC-123BK is a sculpture made out of a multitude of materials. It is a black, plastic ornamental pond, the ones that you originally bury in the soil. The pool has a “decoration” in the form of a plastic pot with a plant, there is dark water in the pool (created by printer ink, serial number LC-123BK, and hence part of the name). In addition to white water there’s white foam (made from washing up liquid). Arrow in the Eye is a stainless steel industrial rubbish bin, with an arrow piercing the outside. Inside of it there’s a tablet playing a GIF of an eye moving obsessively. A metallic sound of a robotic camera invites the viewer to look inside the bin, but to see inside of it the viewer must slide the bin lid sideways, and this is possible as it is attached in a pendulum like axis. What are the meanings of these art pieces? Heaven LC-123BK embraces the supposedly perfect idea of “paradise” and breaks it down into the contemporary reality that exists around me and my current location: Israel. Arrow in the Eye, instead, addresses the subject of voyeurism and surveillance, vision and it’s castration. There’s a sculpture called McGuffin, a term that Hitchcock coined. Can you tell me something about it? A portable apparatus for hanging a medical infusion which in its current incarnation resembles a high-tech robot with red eyes. 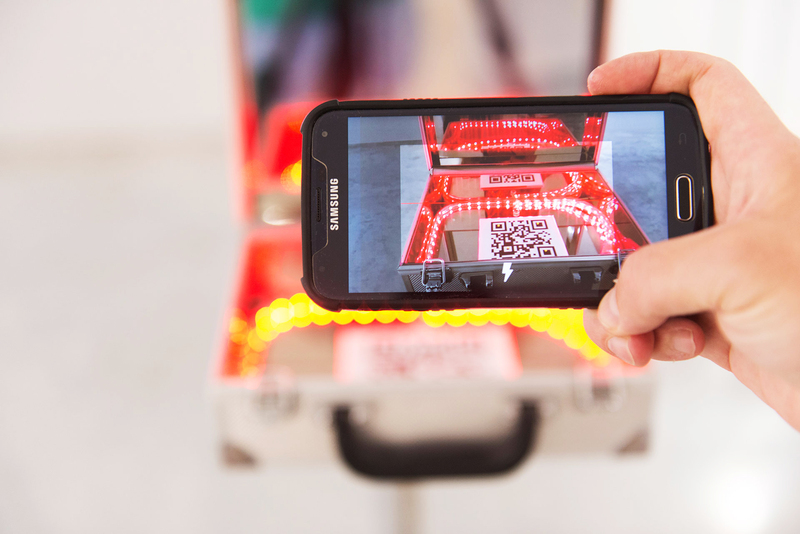 At the centre of the object there is a box made of stainless steel mirrors, at the bottom of which is a barcode that links to a YouTube clip. 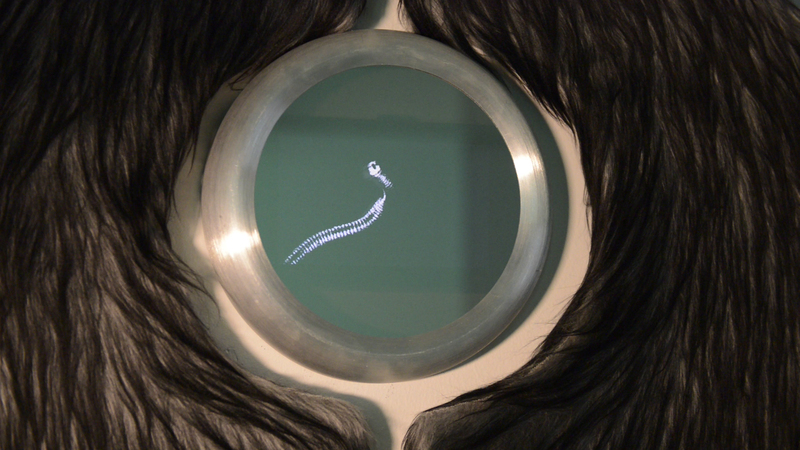 The video portrays a kind of journey from one’s consciousness to the human body. Since the object metaphorically and visually moves between several spaces it reflects the concept of the McGuffin because it leads us into a physical conscious space. What’s the story besides Follow the leader? Follow the leader is made out of an aluminum ladder serving as the physical body of a dictator, but his head is absent and the eyes are held in his hands; the utters / stomach is illuminated by a light that simulates the one of a red incubators. It contains severed silicon tongues. At the bottom of the statue there’s a slow rotating horn with a sharp knife. This work signifies the human blindness and the tendency to blindly follow the leader while losing one’s inner self and ideas.